The Nashville Predators may have lost to the Dallas Stars 4-3 in overtime on Saturday night, but there were positives to take from the game. The Preds got an overtime point to take on slim one-point lead over St. Louis, and also got back a trio of key players in Shea Weber, James Neal and Matt Cullen. Top-line forward James Neal returned after missing nine games with an upper-body injury. Neal scored a goal that got Nashville into overtime, and it was a great team goal. He helped the puck out of the corner and he eventually got the puck back and sniped it past Stars goalie Jhonas Enroth. 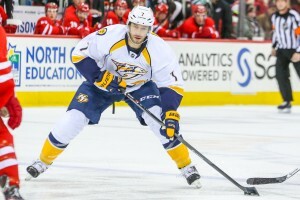 Neal was immediately put back on wing position on the top line with center Mike Ribeiro and rookie Filip Forsberg. He also added an assists and finished with a plus-1 rating. Neal looked like he hadn’t missed a beat on the ice. The Predators have issues scoring goals, and Neal’s return is sorely needed with the Central Division title still in the air and the playoffs looming. 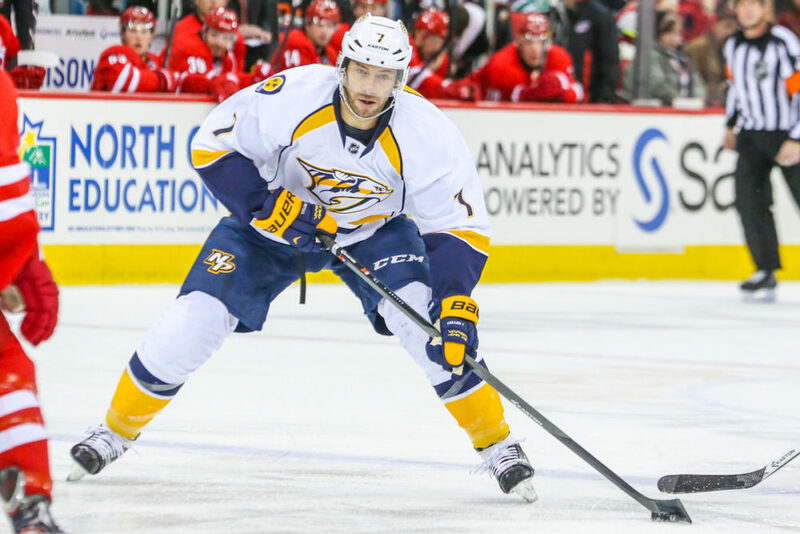 Neal, Forsberg and Ribeiro are the unquestioned best line for Nashville, and they’ll need to be at their best with potential matchups against the Chicago Blackhawks, St Louis Blues or Minnesota Wild. 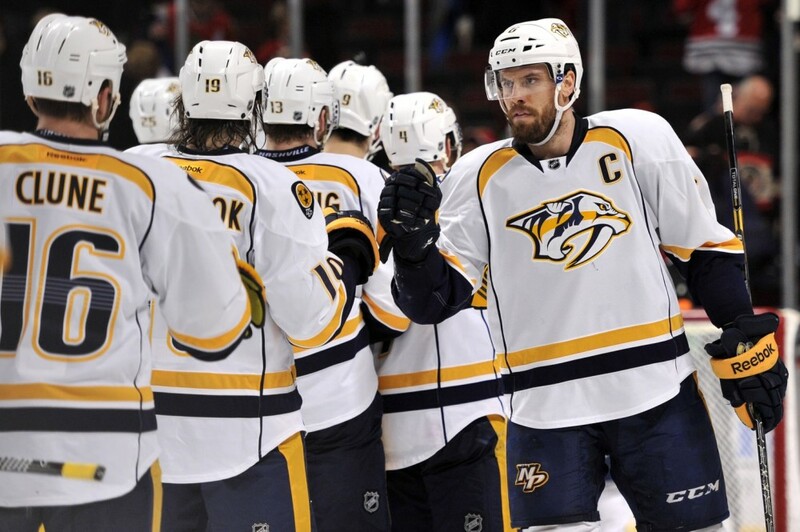 The second big return was that of defenseman Shea Weber from a lower-body injury . The captain led the team with 30 shifts and logged 26 minutes and 34 seconds of ice time. Weber took his usual place alongside dark horse Norris Trophy candidate Roman Josi on the first pairing and on the power play. Weber did not get any points, but topped the team in shots with five. He and Seth Jones also generated a pair of takeaways, and Weber also threw his weight around with a block and a pair of hits. The other defensemen on the team have filled in admirably, but it is nice to have the heart-and-soul of the team back in the lineup. It may take Weber a few games to get in the swing of things, but there’s no doubt that he will be key to any designs on an extended playoff run. The final return that may not receive a lot of fanfare is the one of Matt Cullen. He may not have the same name cache of Neal and Weber, but Cullen is just as important. Cullen was the only Predators center to have a positive faceoff win percentage as he won 10-of-18 draws for a 56 percent ratio. A good faceoff man is key to winning tight games that will happen in the next few weeks if Paul Gaustad remains out due to injury. Nashville are eighth in faceoff wins thanks to Mike Fisher, Gaustad and Ribeiro, but will have to deal with top faceoff men like Jonathan Toews and Antoine Vermette on Chicago and Paul Statsny and David Backes on St. Louis. Cullen’s role could be huge. Dallas may have won the game on Cody Eakin’s penalty shot, but it’s a good sign for Nashville that it battled back to get a point and force overtime. The returning trio played a hand in putting the Predators back into first for the time being. Nashville, St. Louis and Chicago are in a dog fight for the Central Division title, with the Predators leading (104) the Blues (103) and Blackhawks (102). St. Louis and Chicago play on Sunday night and each team will have three games left after that. Neal, Weber and Cullen are going to play a vital role on whether Nashville wins the division or even gets home ice in its first series. Dan Mount is a Nashville Predators writer for The Hockey Writers. He can be found on Twitter @DanMountSports.